3/Al Imran-92: By no means shall you attain Al-Birr until you spend out (for Allah) of what you love; and whatever you spend (from what Allah provides you, what you spend for Allah), Allah surely knows it. 3/Al Imran-93: All food was lawful to the Children of Israel, except what they made unlawful for themselves before the Torah was sent down. Say: “Bring then the Torah and read it, if you are truthful (in your oaths and words)”. 3/Al Imran-94: Then whoever fabricates a lie against Allah after this, they are the wrong-doers. 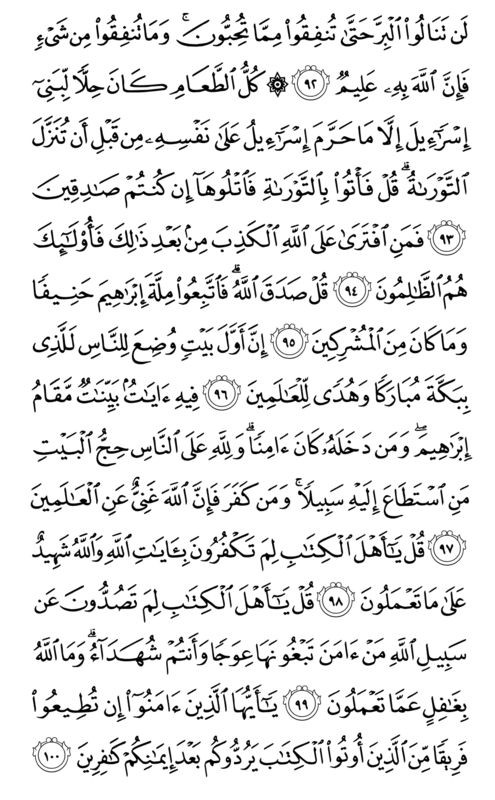 3/Al Imran-95: Say: “Allah has spoken the truth. Therefore follow the religion of Abraham, as being Hanîfâ and he was not of the associators”. 3/Al Imran-96: Most surely the first Beyt (House) appointed for the men was that at Bekka (Makka), full of blessing and a Guidance (Hidayet) for the worlds. 3/Al Imran-97: In it (Beytullah) are manifest signs, the standing place of Abraham, and whoever enters it shall be secure, and pilgrimage to the House is (incumbent) upon the men for the sake of Allah, (upon) every one who is able to undertake the journey (fulfill pilgrimage) to it; and whoever disbelieves, then surely Allah is not in need of the worlds (does not need anything). 3/Al Imran-98: Say: “O People of the Book! Why do you disbelieve in the Verses of Allah? And Allah is a Witness of what you do”. 3/Al Imran-99: Say: “O People of the Book! Why do you hinder people who believe from the Way of Allah? As you seek to make it crooked, while you are witnesses (to the truths) and Allah is not unaware of what you do”. 3/Al Imran-100: O you who believe (who are âmenû)! If you obey a party from among those who have been given the Book, they will turn you back as unbelievers after you have believed.